SingHost Review 2019: Is SingHost a Good Hosting? Singapore-based web hosting provider SingHost was founded in 2004. It focuses on the provision of shared web hosting, VPS server solutions, and domain name registration services to customers inside and outside of Singapore. A subsidiary of Vodien Group, Singapore-based SingHost has more than 10 years experience in the web hosting market. This company offers shared web hosting, VPS server solutions, and domain name registration services to individuals and business organizations. Currently, it has a client base of more than 230,000 users (including 35,000 businesses) around the world. SingHost offers free automatic weekly backups, plus daily backups for a fee, with seven backup copies retained for the previous seven days. It also includes a “time machine” for your website, so that you can undo mistakes. The backups run automatically and do not use the disk space reserved for hosting plans. While SingHost makes a general statement about its use of SSD drives, only VPS hosting solutions categorically use SSD drives, so standard shared hosting may well be HDD-based. The VPS servers use hardware virtualization technology to ensure the highest levels of resource sharing and compatibility. VPS users also get to choose between the CentOS and Ubuntu flavors of Linux. 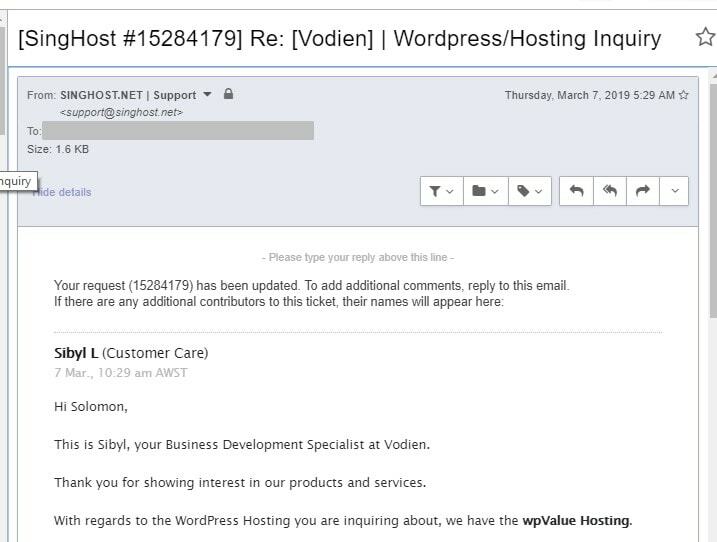 When you try to purchase one of SingHost’s shared hosting plans, you are redirected to the Vodien parent company to complete the purchase. 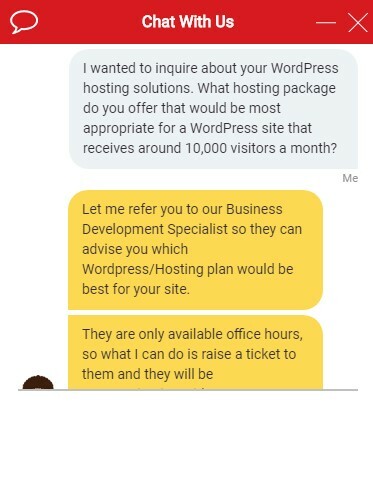 The hosting plans are extremely expensive, on top of which you are invited to purchase some ‘essentials’ (such as an SSL certificate, daily backups, and DDoS protection) at the checkout. Some vendors throw these things in for free. You do get free custom name servers and free setup, but there are no discounts and no free trial to entice you into a minimum three-month commitment. But you do get a 30-day money-back guarantee that should get you out if you change your mind within the first month. The 99.9% uptime is guaranteed, too. For self-support, the parent company’s website provides a well-stocked knowledge base with video tutorials. SingHost offers a range of hosting options including shared hosting plans that can be purchased via its parent company’s website. Shared hosting prices are pretty expensive, but they are backed by superior support. 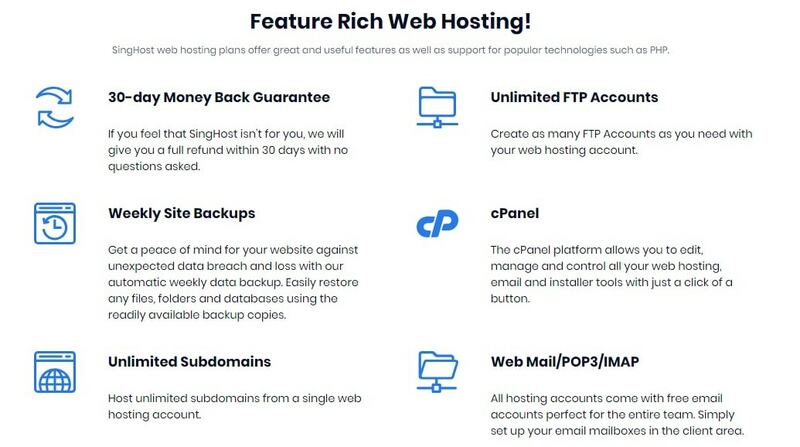 For web hosting in Singapore and beyond, see what SingHost has to offer. Wondering how SingHost stacks up against other Web Hosting companies? Enter any other Web Hosting company and we will give you a side-by-side comparison.